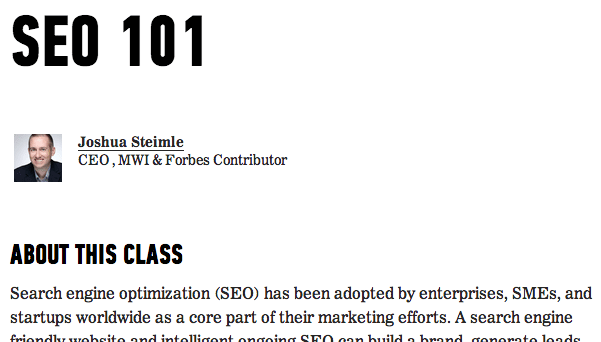 On May 14th, 2014, MWI’s CEO Joshua Steimle, who is also a contributor to Forbes, Entrepreneur, and other publications, will be the instructor at a General Assembly course entitled SEO 101. The class is designed to give executives, marketing professionals, and other interested individuals a firm foundation regarding how search engines work, how a website gets optimized, and how SEO can drive results for organizations ranging in size from startups to enterprises. Search engine optimization (SEO) has been adopted by enterprises, SMEs, and startups worldwide as a core part of their marketing efforts. A search engine friendly website and intelligent ongoing SEO can build a brand, generate leads, and sell products and services. SEO is not just a necessary part of a marketing program for ecommerce or online companies but for traditional businesses like law firms, accountants, financial services firms, and any other company that needs to attract new customers. This class focuses on fundamentals of SEO. For those who know nothing about SEO it will be a great introduction. For those who may have a basic understanding of SEO it will serve as a effective refresher course to bring you up to date on the latest SEO techniques. It is an appropriate class for entrepreneurs, marketing executives, and anyone else tasked with improving online marketing results within their organization. The course is $280 HKD and runs for two hours, including a Q&A session.